It has everything you need! Cough drops, hand sanitizer, bottles, wet wipes, tampons, pads, pacifiers, baby rattles, aloe vera, stain remover, sun screen, sippy cups, bandaids, diapers, snack bowls, tissues... and more! Only thing it doesn't have? This is the Mom Machine in the toddler play area at the museum we visit all the time. But my Mom Machine has been out of patience lately too. For some reason I seem to have plenty of sippy cups, but patience is always out of stock. (If you have an abundance, please send some my way. I'll cover the cost of shipping.) Do you ever feel that way? I think at some point anyone who already has one child and is thinking about having another one steps back and says to themselves, "I'm not even very good with this one. Subjecting another child to my crazy parenting? Who am I kidding? Why would I do that?" This is not to say that I don't still want to have more children. I do. But I also feel unqualified for the job... probably on a daily basis. I try not to dwell on these moments since it doesn't really do any good to think like that and it's kind of a drag on my mood. But as I was lying on the couch earlier, feeling inadequate, I thought about writing about it. At first I thought, "No, that's so whiny and mopey to write about." But that thought was followed soon behind by, "Yeah, but everybody feels this way sometimes. I'm not the only one." I hope that's true so I'm not the only lame mom out there. But I also hope it's not true. I hope everyone else is awesome and that someday I'll be awesome like you all are too. That'd be win-win. The good news is, Olivia doesn't seem to care much. She's used to having a mom who's totally inadequate. She knows my attention span for "let's roll the ball back and forth from now until eternity" is only going to last 5 seconds. She's used to having a mom who's not perfect, so she doesn't expect me to be that way. In fact, thus far she seems to have gone through life completely unscathed by my inadequacies. Never have I been more sure of Heavenly Father's plan for me than I have as a mother. 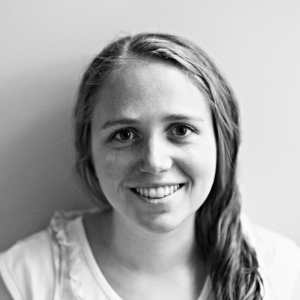 Every time I get close to that dangerous edge of thinking, "I'm not a good mom," that sure and steady quiet voice whispers in the back of my mind, "I know Olivia. And I know you. You can handle her. And she can handle you." That is something I definitely know to be true. Heavenly Father knows what kind of mom I am--with all my parenting beliefs and vast inadequacies--and he gave me a child who needs that kind of mom. And he knows how much I have to learn as a parent, so he gave me a child who is patient with me while she teaches me all the little things I need to learn. What to put my foot down about and what to let go of. When she needs me to be crazy and silly and fun and when she needs me to just hold her. I get it wrong a lot of the time, but we're getting there. And perhaps the most helpful thing she does is not dwell on my mistakes. She needs me to be crazy and fun. I get frustrated and tell her to come back right now and stay with Mommy. I get it wrong. And she doesn't seem to mind. She just comes to Mommy and later when I realize I got it wrong we're crazy and fun and she's just as happy as if I had gotten things right in the first place. Kids. Man, you can learn a lot. Anyway, the Mom Machine is a constant process of re-stocking the things that run out. It's something I'm working on. But hey! 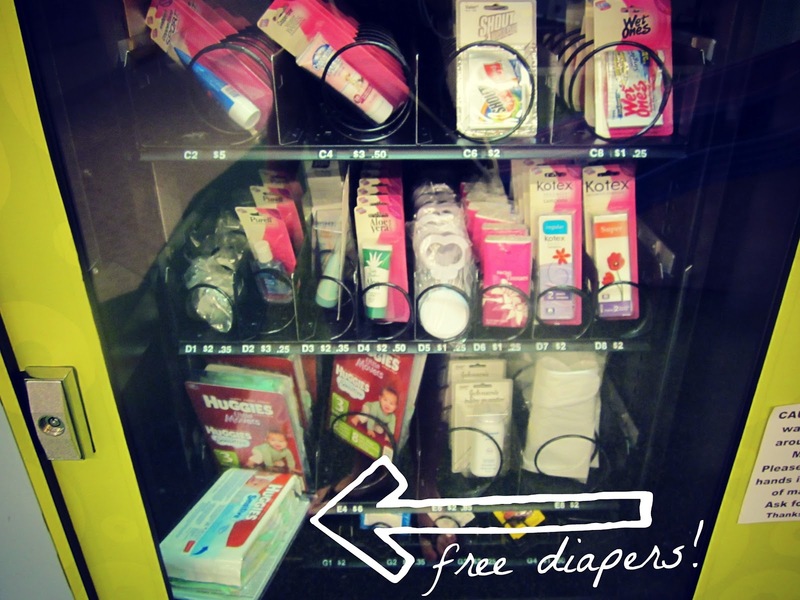 At least there are free diapers! Also, I think you're pretty awesome. And I think you are a good parent because you think about things like this and wonder how you can improve. I think the "bad parent" is one who thinks everything is fine and doesn't really care. 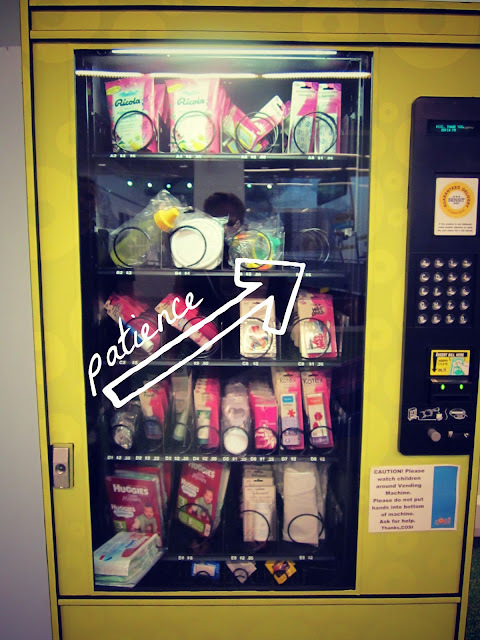 Man, can you imagine how great it would be if you could buy patience from a vending machine? I have the same thoughts. On The positive side, multiple children can play together (without you!). You are a great mommy. 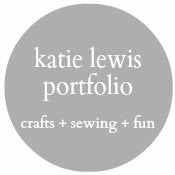 Great post Katie! You are definitely not alone on this one. We all feel this way at one point some time during the day! Man, being a good mama is one tough job! I am sure you are great at it! Juat don't think that great equals perfect. You can be the best mom for Olivia without having to be the perfect mom. That is an awesome background color for Olivia. Full disclosure: I often felt that way when you were little, too. Maybe that's why you get impatient now? Maybe we're actually all that way? And besides, living with a 2- or 3-year old is kind of crazy-making. Somehow we all get along. And before you know it, she'll be SO OLD, and you won't be playing back-and-forth-with-the-ball. Whoop whoop! Sometimes, when it's 3 in the morning and Calvin screams whenever I try to put him in his crib and the only thing that will help him calm down is to sit in the rocking chair and sing, I get the strongest feeling like a hug and a whisper of "I gave you this child, he needs you to help him be healthy and strong and learn and grow." And then, for a few minutes, it gets easier and I enjoy sitting in the rocking chair, rubbing his back, singing "I Love to See the Temple." And then I realize I need him to help me be healthy and strong and learn and grow. This is something I do that helps me. I set myself a play timer. I will play with all my heart for a set amount of time, 10-15 minutes. I will play candyland and chutes and ladders and color and play tickle mom-ster. It seam to fill her cup of mom focused play and then I take a break. I found it works better then constant halfhearted play. also, I agree with Bryan. Oliva is super lucky to have you as her mama. Oh this was so honest and beautiful and I loved it! Being right on the brink of motherhood I've had a couple overwhelming days of thinking, how can I do this?! But I love how quickly I'm reassured from above that this little boy to be and I are meant to be together and learn from each other and most importantly love and take care of one another. Man what a great (and terrifying) thing learning lessons is, haha! She is lucky to have a mother that cares about her. And loves her. And wants the best for her. Oh my gosh I question myself everyday. And patience - send some my way too! I just got through reading "French Children Don't Throw Food", by Pamela Druckerman and it's got some real food for thought. I'm an Aussie, but I suspect based on this book that the predominant American and Aussie parenting style is to be overly indulgent and concerned with the child as the centre of of the universe and family and not really respecting the needs and desires of the adults (parents). The French see things in the reverse - they are not cold or distant parents, but are very good at creating boundaries and children who are able to amuse themselves. I've definitely paraphrased and simplified that wayyyyy to much (sorry Pamela), but it really held some wisdom for me. Definitely worth a look. And incidentally I think you seem like a wonderful Mom! I am often awed by your relationship with your daughter! 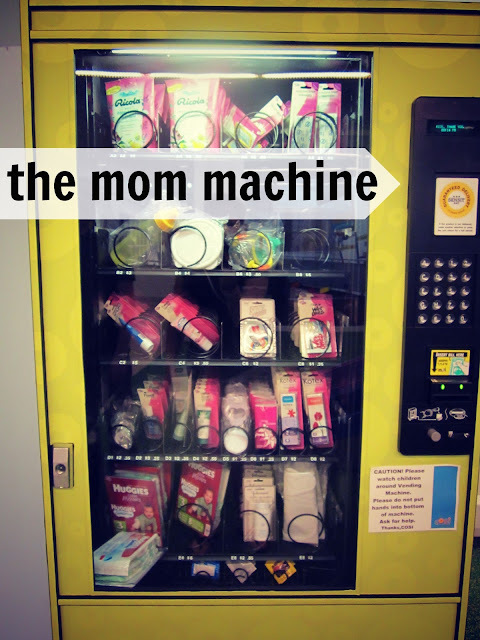 I love that Mom machine...whoever stocks it must be a mom. I relate to your post. People keep telling me that I have the easiest kids, but somehow I still run out of patience with them on a sadly regular basis. Toddlers are hard, I decided. Especially when they don't feel good and don't have the ability to just say "Give me a hug, I feel cruddy today." Instead it turns into the endless whiiiiiiiine. You must be a good mom, though, because Olivia can't stand to part with you for a couple hours of nursery ;) And don't worry, my toddler-play attention span is pretty pathetic, too.